Australian corn chip brand Doritos®, who are owned by PepsiCo have partnered with Universal Studios to create a snack to accompany the new installment of the Jurassic World franchise, Jurassic World Fallen Kingdom. 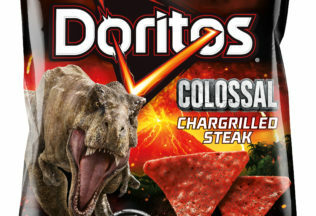 The limited edition Doritos Colossal Chargrilled Steak is a lava coloured chip. The movie inspired launch will attempt to situate the brand as a snacks category leader and drive brand awareness by featuring an on pack promotion across all Doritos flavours. Consumers will have the chance to win a trip to Hawaii as well as $500 daily cash card prizes. “We know our consumers are always on the lookout for new flavour sensations, so it made perfect sense for us to pair up with our friends at Universal Studios and create something bold and exciting”. Doritos Colossal Chargrilled Steak is available in 80g in petrol and convenience stores now and will then launch in 150g in all supermarkets from June 4th. RRP 150g $3.29. Baskin-Robbins is selling a special flavoured ice cream for Halloween; Chocolate Trick ‘n Treats.